In life we sometimes just crave fresh air. For me, Clapham Common rarely hits the spot and I long to smell the countryside or have a lung full of salty sea air to feel relaxed, detoxed and alive again. Guernsey has all of the ingredients for a rejuvenating weekend, it is perfect for a rural retreat or beach break. The Farmhouse Hotel is a gorgeous boutique hotel with just fourteen individual rooms situated ten minutes drive from the Island's airport. The house dates back to the fifteenth century but has been completely renovated to combine old and new touches seamlessly. Rooms are luxuriously appointed and include little extras that give this family run hotel a home from home feel. The underfloor heating was a five star treat and the fresh milk and homemade cookies a reminder that guests are made to feel very much at home. The hotel bar offers a great selection of champagnes, wines and spirits which can be enjoyed by the fire, under the beams in the chilly winter months or by the pool taking in the stunning summer evening views. The restaurant offers simple and delicious dishes with a Mediterranean influence. Meat is locally farmed and the seafood is generally freshly caught that day, vegetables and salads are seasonal and bursting with flavour. Nowhere is too far on Guernsey, for shops, bars and restaurants head to St Peter Port but you'll be unlikely to stumble across any wild nightlife. Art and literature lovers will enjoy the numerous galleries to visit and a trip to Victor Hugo's house and gardens makes for a very cultural afternoon. Those interested in the history of the Second World War will find the details of the occupation fascinating, there are many forts around the Island and underground museums similar to the war tunnels on Jersey . Long country and coastal walks are the best way to work off some of the delicious food that can be found in the island's pubs or after an indulgent cream tea made with clotted cream from the beautiful local cattle. 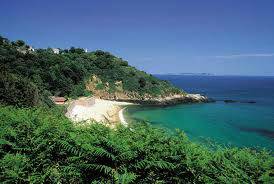 Guernsey has 27 beaches and most are sandy. Petit Port is a stunning secluded bay, difficult to access but well worth it if you can bear the steep climb at the end of a long summer's day. Blue Island Airways fly daily from London City, Bristol, Manchester and Southampton. The service is great, the staff are friendly and this is a little bit like traveling on your own private jet with a few new friends!